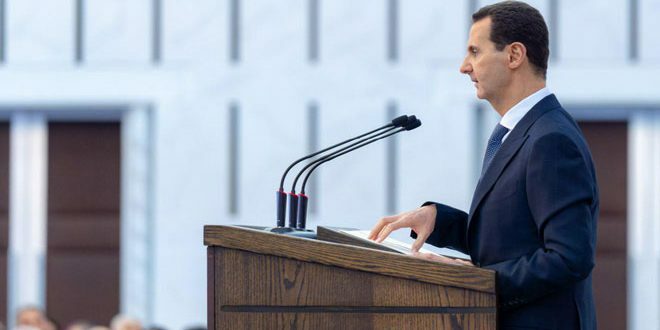 Speech of the President of the Syrian Arab Republic, Bashar al-Assad, during his meeting with heads of local councils from all provinces, February 17, 2019. Damascus, SANA- [...] President al-Assad said that the studies issued during the war on Syria by research centers in the countries that support terrorism, as well as the statements of officials in these countries, it could be seen that these countries’ policies towards Syria are based on two pillars: the first is supporting terrorism which is a temporary pillar, and the second is applying a type of decentralization that is different from the one law 107 proposes; a decentralization that weakens the state’s authority and marginalizes it, thereby weakening sovereignty, nationalism, and social cohesion, which would lead to social division and ultimately geographic division. [...] Journalist: Today, Israel considers and keeps repeating that the red line is that you manufacture, inside Lebanon or at the (Syrian) border, precision missiles. I remember, Eminent Sayed, that in 2006 or 2007, after the 2006 War, you astounded us, and you shocked the Israeli enemy by revealing that you (already) possessed missiles capable of hitting the most southern places of occupied Palestine, up to Beersheba. Now it is as if (Israel) discovered something new, namely precision missiles. Can you explain it to us? Journalist: [...] Eminent Sayed, you often promised the Israeli enemy that if he invades or attacks (Lebanon), your retaliation will be overwhelming. And during your last speech, on November 10, you confirmed this, but you used a specific formula: "We will retaliate and you will regret it." What did you mean by that?